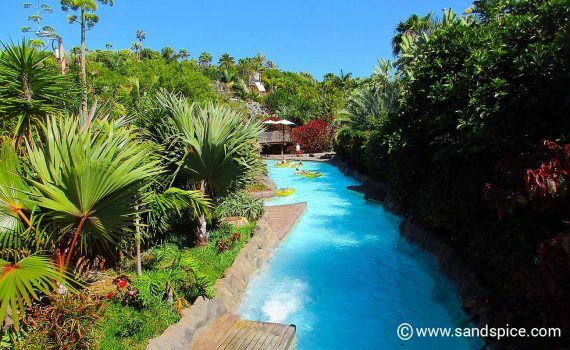 If you are planning to spend some time in the south of the island, then the Tenerife Siam Park sensation is something not to be missed. 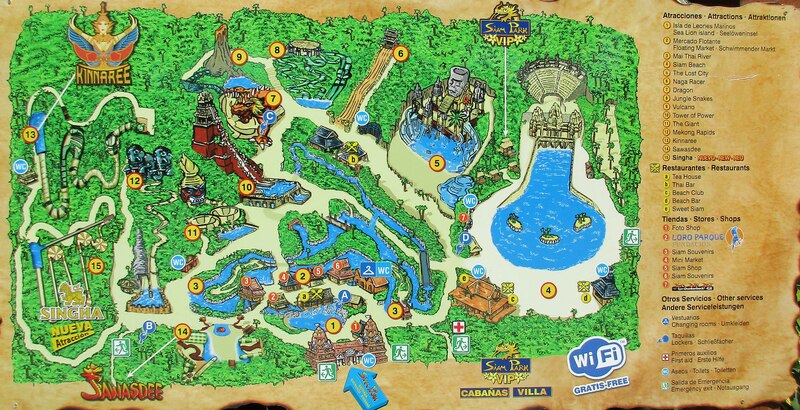 Siam park is a large, clean, beautifully landscaped and well organized water park, officially the No 1 water park in the world. If you come to Tenerife, this is absolutely a ‘must do’ attraction. 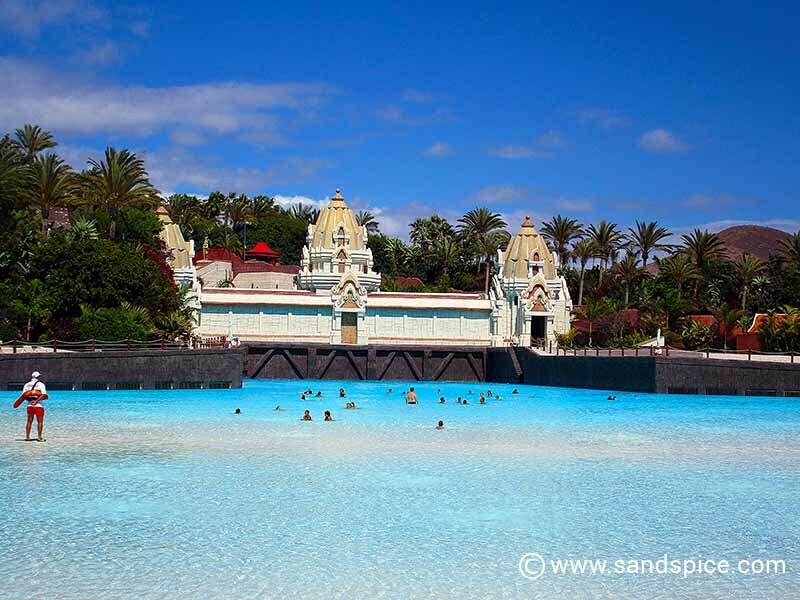 Even if you are not bothered about the rides, this is a great place to relax on their huge artificial beach – with real white sand and a Gi-normous Wave Palace. 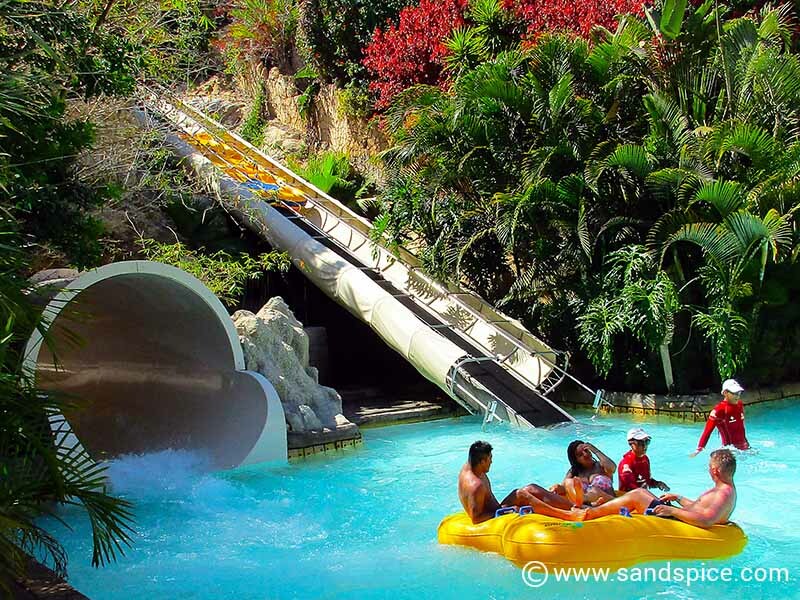 Designed for all age groups, Siam Park is not just for the kids. In fact, several of the more daunting rides are prohibited to children under 14 (or anyone else under a certain height). Our day out to Siam Park didn’t start too promisingly. Without any familiarity with the local bus network, it took us a while to reach Los Christianos, from where we eventually managed to take another bus to the Water Park. 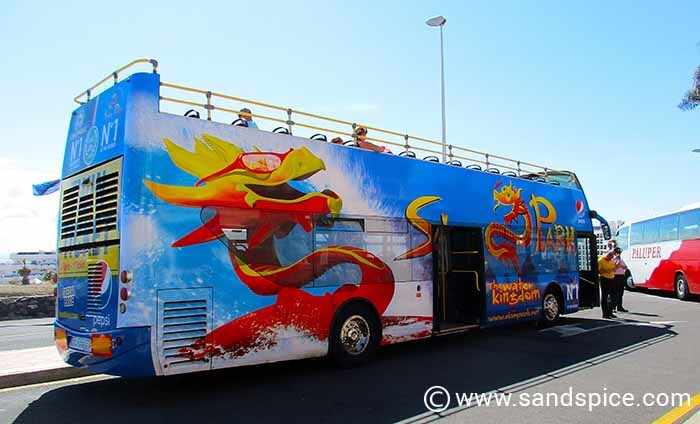 In fact, there is a regular free shuttle service running throughout the day to and from Siam Park from Los Christianos, Las Americas and other locations on the island. These buses are easy to recognize from their colorful park advertising. You just need to purchase a valid ticket to the park to board the bus. When you leave the park, the same free shuttle service will also take you back to most of the main hubs on the island. Entrance to the park is €34, (children 3-11 are charged €23) with extra small supplements for towels and lockers. 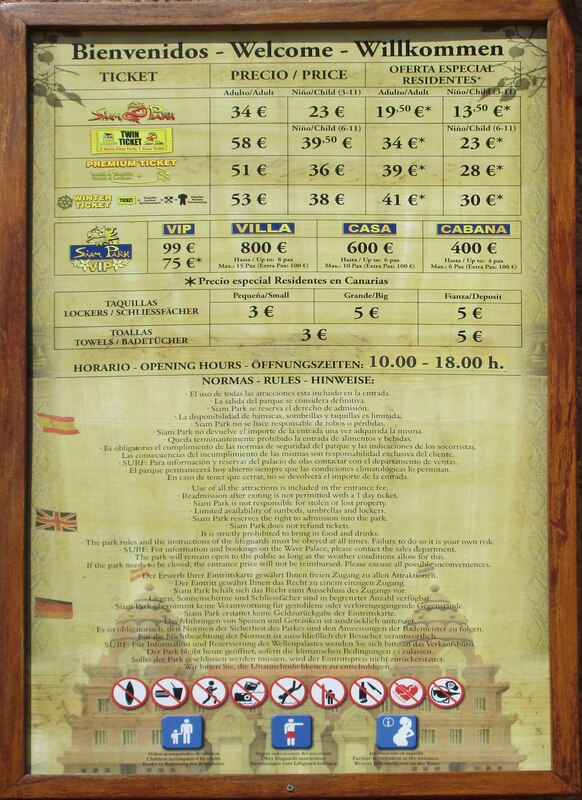 Click here for full details on pricing and opening hours (multi-language). If you also plan to visit the highly-recommended Loro Park during your stay in Tenerife, there is a worthwhile reduction when you buy both park tickets together. 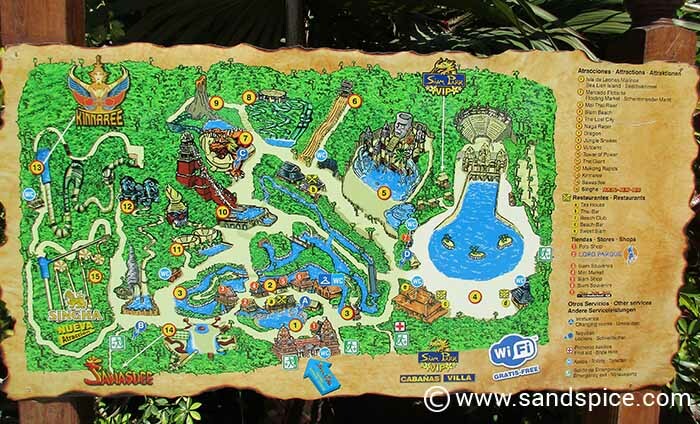 Siam Park is beautifully landscaped with trees, bushes and flowers. It’s a pleasure just to walk around and enjoy the colorful atmosphere. There are plenty of reasonable-priced places to eat and drink while you observe some of the more hair-raising water rides on offer. For the more adventurous visitors, there is a selection of 13 water ‘experiences’ to choose from. The entrance to each of these rides features a useful information board which explains the highlights and difficulty (read ‘scariness’) of the ride. Similar to a skiing resort, each ride is categorized by a color: green, yellow or red. The green rides are fine for everyone, whereas the yellow category rides are pretty hairy. With most of the red category rides there is a warning for people with heart or back conditions. … this is no idle warning. The first ride we took was the popular (and relatively tame) Mai Thai River ride. This is a leisurely family-friendly ride (the longest in the park) which won’t stress you out too much. Upping the scale, our 2nd ride was the Singha. After this we tried in quick succession the Dragon and one of the 3 Jungle Snake rides (we chose the Cobra). Apart from the Tower of Power, you descend all rides on 1, 2, or 4-person inflated rings. Some of these rides plunge you into total darkness during extreme spinning sections of the descent, which is pretty unnerving. Before taking a ride you need to carefully read the basic instructions (all-language pictograms) and heed advice from the attendants at the top. You have to take care to keep all limbs inside the rubber rings and to hold on tight to the side handles. Some rides throw you sideways at close to 180 degree angles. I suppose some experts have carefully worked out all the centrifugal forces, but it seems a miracle that people aren’t thrown out of these lightweight plastic craft. There are medically trained staff at the exits of the more extreme rides, which is at the same time both encouraging and unsettling. After our first three rides, we scooted over to the beach to experience the biggest artificial waves in the world in the Wave Palace. We then wandered off to warm up on the suntrap beach. Walking around the park in wet swimwear in May can get a bit chilly – especially after climbing to the top of some of the higher rides where you really feel the cool sea breezes. Of course, we had to leave on a (literal) high. We tried two more rides – the Vulcano and the Giant, and finally it was time for the vertigo-inducing Tower of Power. 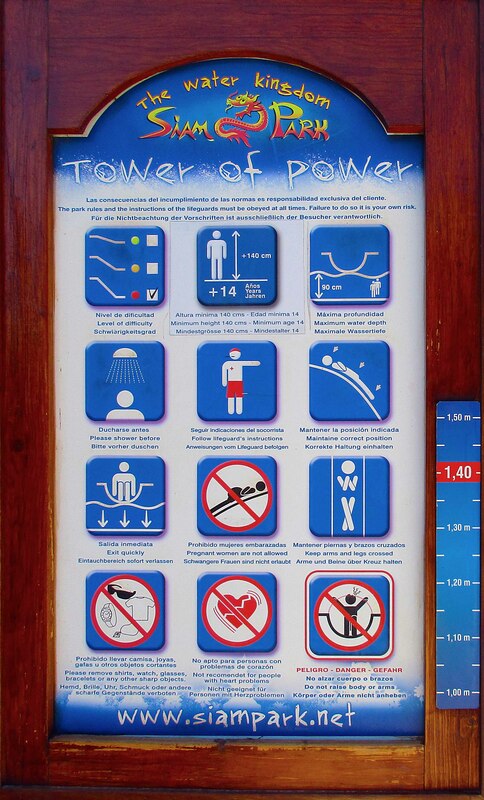 The Tower of Power is an insane 30 meter drop from the chilly top of an Inca temple, vertically down an open slide then underwater through a shark-infested tank before being spewed out with a rush of adrenaline into a pool before the waiting spectators. This is the one ride in the park which is very methodically supervised from above. Each guest is given individual instructions and carefully positioned with arms across chest before being gently pushed over the precipice. 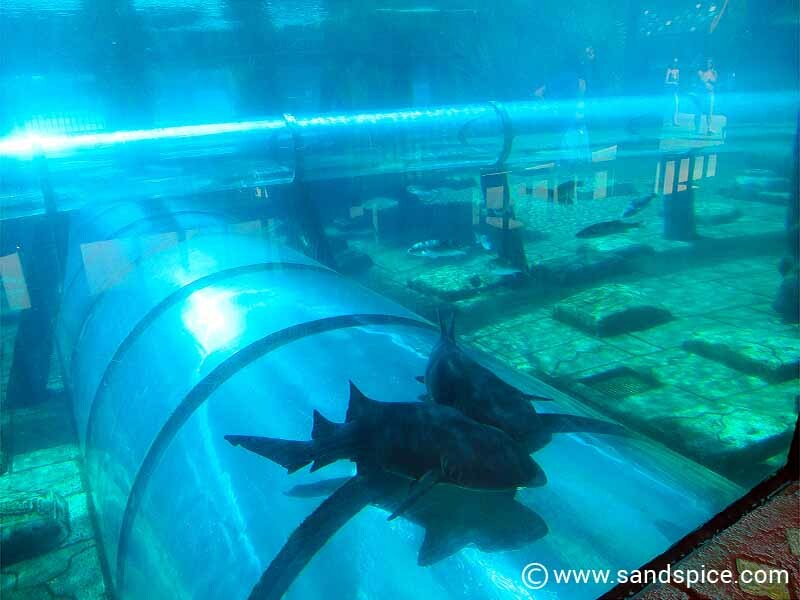 The initial angle of decent is so steep that you can’t even feel the slide beneath you: You feel just a rush of water and air as you hurtle down to the shark plunge. Although it feels much longer, this whole cathartic experience takes around 8 seconds. The Tower of Power is both thrilling and terrifying. A veritable rite of passage for anybody visiting the park. Understandably enough, cameras and other objects are not allowed on the actual rides. This is just as well, since you’ll be busy enough just hanging on for your life. On the day we visited there were very short queues for the rides, so we did very little waiting around. Following our day out at Siam Park, we were looking forward to visiting their sister company – Loro Park (‘parrot park’) – in North Tenerife. If Loro Parque is as much fun as Siam Park, we were in for a treat.